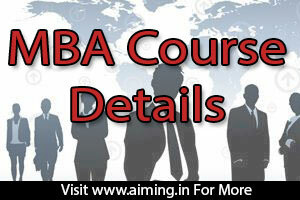 MBA COURSE DETAILS: MBA full form is Master of Business Administration. It is an internationally recognized degree. MBA course is versatile and it is used internationally. MBA is having huge demand in the business administration industry. Candidates who completed MBA course from Top b schools will be able to get good packages since they will get placed in top level management companies. It is a 2 year course and has demand across the globe. MBA course demand is increasing because of increasing MNCs and industries across the world. 5 What Type of Courses Available in MBA? 11 What Next After MBA? For pursuing MBA courses, the candidate should complete his or her bachelor degree with minimum of 50% marks and 45% in case of SC/ST students. Age is not taken into consideration for pursing MBA course. If the candidate wants to get specialization in MBA course, then he or she must have full time work experience of at least 2 years. For getting admission top b schools candidate should pass the entrance test which will be conducted by the b school. The candidates should check the fee details in the corresponding examination’s official website. Some of the fees details of entrance exams are given below. AIMA-MAT fee could be 1200rs. CAT fee could be 1600rs. CMAT fee could be 1400rs. What Type of Courses Available in MBA? Are you searching for the types of MBA’s Available in India? Here you can get the information. There are a variety of MBA programs to fit your schedule. Many colleges and universities offer 2 year full time M.B.A, Part-time MBA programs, Executive MBA programs, Distance learning. This type of MBA normally takes place between two academic sessions. This course takes approximately 2 years to complete .You can do 24 months regular programme from any of the M.B.A institutions. The concept of Part time MBA comes from the need of those students who wants to do an MBA but do not have enough time to devote for a full time due to prior engagements. The executive MBA allows the students to earn an MBA or another business-related graduate degree in 2 years or less while working full time. Participants come from every type and size of organization – profit, nonprofit, govt and also can represent in a variety of industries. The distance learning programme is of 2 year. It is for those students who have not enough time to go for regular studies. There are many different types of MBA programs. The information below provides you with an overview the different types of MBA specializations available. MBA course fee varies according to the institution standards. MBA syllabus and subjects will vary based on the university. Candidate can check the fee syllabus and subjects in the respective institution’s official website. Top 10 institutions are listed below. Since MBA course study is little bit expensive, it is important to know the job opportunities. Most of the b schools charge high amount, the job opportunities also worth it.MBA graduates has wide range of jobs in many fields in different subjects. MBA course job opportunities include the following and The pay of the jobs is according to the experience of the graduates and their course in MBA. In the current scenario, management courses are highly in demand. Here we present a list of Best colleges for MBA with Highest Salary Package in India in addition to the respective course offered. Starting salaries after completing MBA varies according to various parameters: College, Stream/Specialization, Company Placed, Applicants Profile and also Experience. As per my view Good Salary Package’s are directly depends on your Knowledge and your hard work. This is another common question I received from the regular visitors. Most of them asked me about What to do after MBA. I will try to answer this question. After MBA if you don’t have a job offer in hand you just go for some course to do, I strongly suggest you apply for SAP Certification Course or PhD wherever possible. Sir I am third year student so I can apply mba education.